Google Shopping Express, AmazonFresh: Which mega-company will succeed in revolutionizing shopping? You order online. Your stuff comes the same day. You never have to leave your house again. 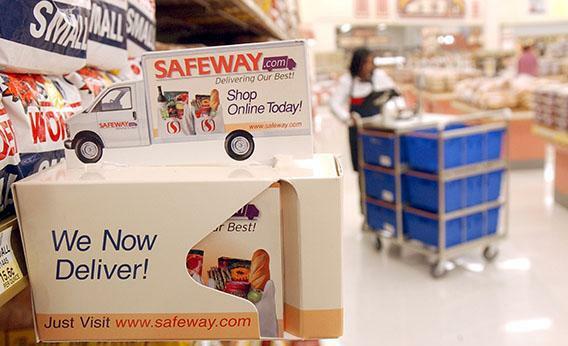 An advertisement for the new Safeway.com sits on a shelf at a Safeway store March 13, 2002, in San Francisco. But that’s just the start. The longer-term promise of same-day shipping is that it will bring the same revolution to groceries that Amazon once brought to books and music. That advantage is remarkable selection. At supermarkets, shelf space is finite and expensive, which is why you can rarely find everything you need at a single store. Safeway, the big mid-market chain in my neighborhood, suffices for about three-quarters of purchases, but a lot of times I’m looking for specialty goods—higher quality seafood, some specific ethnic spice, fresh roasted coffee beans, high-end local bread, a snooty variety of coconut water—that requires a trip to Whole Foods, Trader Joe’s, the Chinese or Indian market, or some other out-of-the-way place. (Look, people: First-world problems are still real problems.) Ideally, a single store would carry everything I need, but that’s not possible—there’s just not enough demand for fresh Indian curry leaves or live lobsters for my local Safeway to dedicate the necessary shelf space. But if a store could sell to everyone across a large metropolis, it could pool demand for even low-selling goods. This is the fantasy scenario for same-day shipping: It would create a one-stop shop for everything you’d ever want. It would give you access to the long tail of groceries. Google and Amazon are trying to solve this problem in slightly different ways. Google’s service doesn’t maintain any local warehouses. Instead, everything you buy comes directly from a local store. To improve efficiency, the system tries to get your goods from the store located closest to your house. (The items I ordered from Target were shipped from a store 6 miles from my house.) Also, unlike AmazonFresh, Google Shopping Express does not yet sell milk, produce, and other perishables, but the company is working on ways to make that possible. It also seems likely that Google will try to expand selection by contracting with lots more retailers. The company seems to be thinking about the program in the same way it thinks about its online advertising system—in the future, any store that wants to join will be able to sign up to sell its goods through the system. In the same way that Google collects a few dollars when it sends a customer to an advertiser’s site on its search engine, Google takes a commission from the store for every purchase made through Shopping Express. AmazonFresh also contracts with local retailers. Its service features items from dozens of restaurants, ethnic supermarkets, meat and seafood stores, and bakeries in the Seattle area. But unlike Google, Amazon also maintains its own warehouse of items that it sells directly to customers. Many of its fruits and vegetables fall into this category. Keeping its own goods allows the company to maintain tight control over quality. One nice feature is an item-by-item rating for every produce item: Today’s avocados score only a 2 Radish rating (out of a potential 5), which means they’re just average, while the watercress are looking great with 4 Radishes. I don’t live in Seattle so I’ve never shopped at AmazonFresh, and I’m kind of glad I don’t, given the cost of its produce. English cucumbers are $5, about $4 more than I pay for them locally. Serrano chilies go for more than $6 a pound. Organic carrots are nearly $5 a bunch. These aren’t the low prices that Amazon is known for. They’re the high prices that Whole Foods is ridiculed for. What’s more, while AmazonFresh’s selection is large, it doesn’t include everything I can find within a 10-minute drive from my house. It doesn’t carry curry leaves. It doesn’t have whole fish. It doesn’t have gluten-free cornbread mix, fresh-roasted coffee beans, or the world’s best coconut water. So while the long tail of groceries may one day be possible, the tail’s pretty short in 2013. Which service will win out, Google’s or Amazon’s? So many firms have failed to conquer the same-day shipping business over the years that it might seem wise to bet against both of them. Especially when it comes to perishable goods—where profit margins are notoriously thin and customer expectations are incredibly high (you’ll never shop at a store that breaks your eggs)—it won’t be surprising if both companies find it impossible to offer services worthy of their ambitions. On the other hand, the reward for getting same-day grocery service right could be incredible, especially for Amazon. If the online giant can increase its selection while keeping down prices, it would transform itself from a company that you interact with once or twice a week into one that you go to every day. It would become the world’s most ubiquitous retailer. But even better, it would be the world’s most beloved retailer—because, believe me, when a guy brings toilet paper to your house just when you need it, you love him. Whatever the costs, however daunting the challenges, that’s too big a prize for Jeff Bezos to ignore.